My husband and I took a day off together. A rare thing for us in the summer, since he spends many hours farming and farmer’s-marketing. Of course we chose to do something “plantsy,” and ended up at Chanticleer garden in Wayne, Pennsylvania. We had listened to many of our friends sigh over the beauty and romance of the place for years, and so finally cleared a little space to be together, outside, in someone else’s garden. We strolled along the smooth winding path only a few moments before I slipped my hand in his, and our mutual dream of creating a “hobby” garden on the farm sprung to both of our lips. We walked ever so mindfully and slowly, taking in flora both great and small. I sighed with delight over the hidden spiral staircase, laden with a bower of green and crowned at top by a tiny, yet inviting secret door. We hugged mighty oaks, too big for our arms to stretch around...actually, I did the hugging and the Farmer looked at me with a small amount of embarrassment. We peered at giant, chubby koi fish who looked back at us with the exact same expression our chocolate lab gives us when we sit at the dinner table. And we sat on the cool stone wall beneath towering white pines, listening to the gentle swish of a water wheel behind us, swatting the occasional mosquito. The longer we walked, the quieter we became. A good kind of quiet that happens when the internal chatter in our brain finally steps aside and lets us remember to feel, to connect, to drink in the beauty around us. 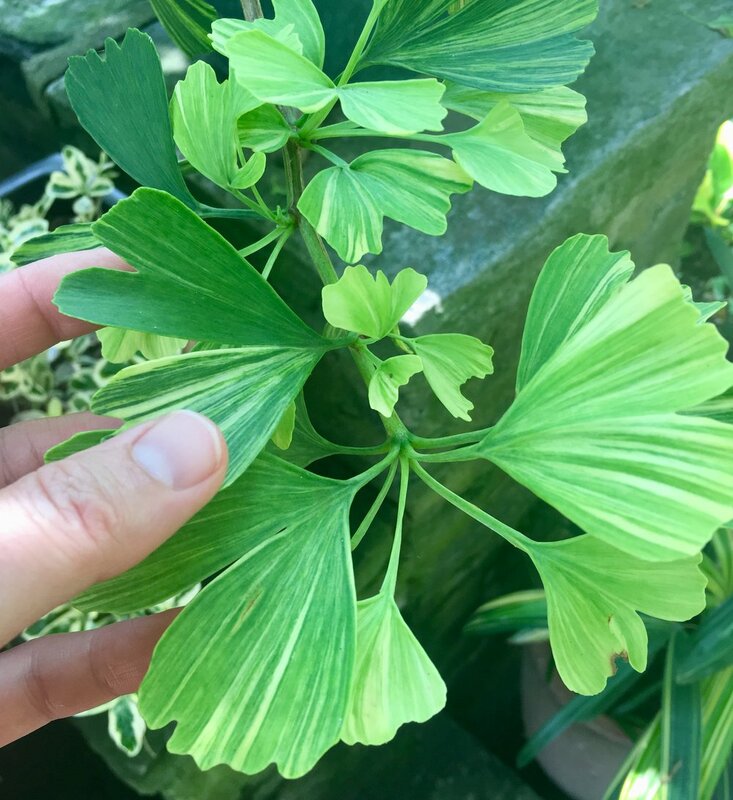 In that moment I came upon a small ginkgo tree, with a variegated leaf, This plant speaks to me. I fell in love with it as a child, sitting in the crook of its branches, pretending I was riding a galloping horse. The fan-shaped leaves, green in summer, turn pure yellow in fall. When the leaves are first touched with yellow in late summer they make a wonderful tonic remedy for the circulatory and nervous systems. Ginkgo has a movie-star-reputation as an aid for the memory, and in fact it has been shown to improve cerebral circulation and so give memory and recall a boost. Since it dilates blood vessels, allowing the circulation to move more freely it is thought to be useful for impaired circulation that occurs in conditions such as Raynaud’s Syndrome, peripheral neuropathy and some migraines. This same characteristic might explain it’s usefulness for tinnitus (persistent ringing in the ears) and impaired cognitive function. It is thought that both of these conditions can be helped with improved circulation to the head. Ginkgo has also taken a key role in an herbal protocol for post-concussion and post-stroke victims, alongside bacopa, rosemary, gotu kola, hypericum and conventional medical treatment when appropriate. Ginkgo is contraindicated in anyone suffering from vascular headaches or aneurisms, and the plant should be used with caution with MAO inhibitors (some anti-depressant medications) as well as with blood thinners, such as heparin. Learn more about herbs that support brain health naturally in a FREE online class taught by Mary Bove, ND, Wednesday August 15.